Marilyn Cover, Executive Director of Oregon’s Classroom Law Project, has been named recipient of the 2018 Sandra Day O’Connor Award for the Advancement of Civics Education, presented annually by the National Center for State Courts. The award honors an organization, court, program, or individual who has promoted, inspired, improved, or led an innovation or accomplishment in the field of civics education related to the justice system. The date of the award presentation is to be determined. Cover was selected for determination, creativity, leadership, and reach. 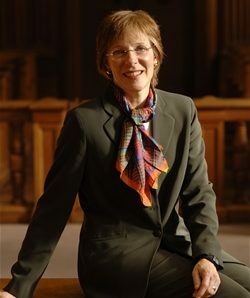 “Her impact on students and teachers – as well as judges, legislators, and other elected officials – extends far beyond her home base in Oregon, where she and a handful of lawyers, teachers, and judges started what is now the Classroom Law Project (CLP) in the early 1980s,” Oregon Chief Justice Thomas Balmer said in his nomination letter. CLP includes classroom instruction, teacher training, mock trials, and courtroom visits. Cover’s commitment to civics education spans four decades and has impacted thousands of students. She successfully convinced Oregon governors and legislators to a enact a state statute that designates the first Friday in December as “Oregon Civics Day for Teachers,” for which the legislature provides funding for teachers to attend CLP’s hands-on conference at the state capitol to hear from leaders representing the three branches of government and to receive instruction and materials to help them teach civics. One of Cover’s earliest successes was establishing a Street Law program at the Lewis and Clark Law School. Established in 1979, this program – which she still teaches as adjunct faculty – places law students in high school classrooms, teaching students practical principles of law. The relationships she forged in this extensive program are a significant part of the network of support for CLP. Coincidentally, at the time the NCSC Board of Directors was meeting to select the Sandra Day O’Connor recipient – April 27 – Cover was in Washington, D.C. assisting students and teachers from two Oregon High Schools that were finalists in the national We the People: The Citizen and the Constitution competition. The first-place winner was Portland, Oregon’s Grant High School and Portland’s Lincoln High School placed third. The National Center for State Courts, headquartered in Williamsburg, Va., is a nonprofit court organization dedicated to improving the administration of justice by providing leadership and service to the state courts. Founded in 1971 by the Conference of Chief Justices and Chief Justice of the United States Warren E. Burger, NCSC provides education, training, technology, management, and research services to the nation’s state courts and courts around the world.